The Fruit Fly Patrol is a versatile, decorative fruit fly control system designed for commercial use in areas up to 1000 square feet. 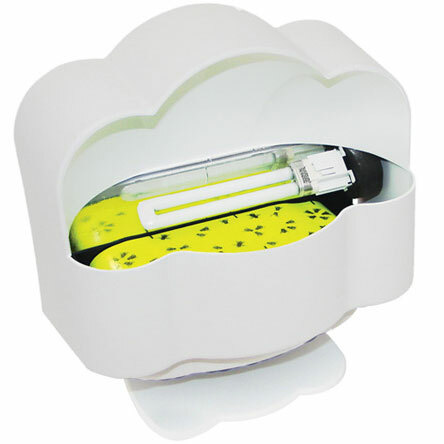 Its unique design allows the insect trap to be wall mounted or placed on a flat surface. The Fruit Fly Patrol uses special UV light, attractants and decoys on the trapping surface to lure and capture fruit flies and gnats. It is especially well suited in bars, wineries, delis, and other food establishments. Specially engineered reflective top shell. Exclusive auto advancing 30 day cartridge system. Environmentally safe - no scattering of zapped fly parts or sprayed chemicals. Unique cartridge placement - directly under lamp. Complete decorative fly control system. Meets USDA & FDA guidelines. Research proven flying insect attracting UV light device. Easy to maintain, easy to clean. Dimensions: 12.5" x 12" x 6.25"
Coverage: Up to 1000 ft.